A premature baby is born with a life-threatening medical issue. A newborn is experiencing cardiac or respiratory difficulties. A toddler accidentally consumed something poisonous. 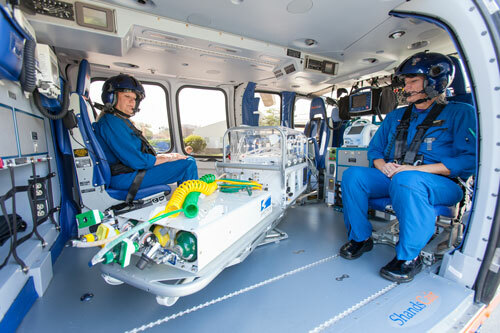 Whatever the emergency might be, if the child is under the age of 5, ShandsCair’s neonatal/pediatric flight team is ready to handle the situation. 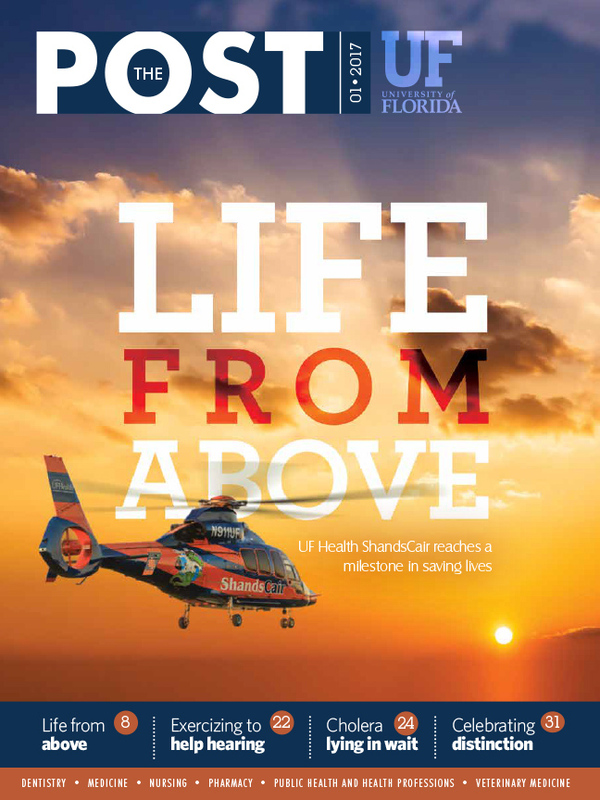 When Laurie Whidden, B.S.N., RNC-NIC, EMT-B, and Lily Irwin, R.R.T., are informed that a newborn needs to be taken to one of UF Health’s neonatal intensive care units, they decide how they are going to get the baby from point A to point B. Several factors play into this decision: weather, distance, availability of vehicles and, of course, the severity of the baby’s health condition. Whidden and Irwin weigh their options before preparing their equipment and making their way into the clouds. While in the air, Whidden and Irwin work tirelessly to improve the baby’s outcome. Active cooling for hypothermia therapy is a device that lowers a baby’s body temperature to a certain degree to protect the baby from brain injury. Nitric oxide therapy uses a specialized gas to dilate the lungs if the baby is undergoing respiratory issues. Extracorporeal membrane oxygenation, or ECMO, is a heart-lung bypass machine that moves the baby’s blood to an artificial lung and back into the body, ultimately taking over the work of the heart and lungs if the baby is experiencing a life-threatening condition. Whidden and Irwin have have even flown out of the country to pick up babies who are ill and transport them to UF Health’s neonatal intensive care units, although most of the time they stay in Florida and its surrounding areas. For babies who are in critical condition in Florida, neonatal medical professionals like Whidden and Irwin might be their one shot at survival. “State law says that if a baby is under a certain age or weight, he or she has to be transported by a neonatal/pediatric team,” Irwin said. This means that some infants cannot arrive at an emergency facility by a county ambulance. So if the weather is bad, ShandsCair’s neonatal/pediatric team drives their own ambulances and picks up the babies themselves. To be able to care for more than one baby at a time, ShandsCair has two neonatal/pediatric teams on duty each day. If one team is on a longer flight, a second team remains ready to respond to a new call. And in some cases, Whidden and Irwin transport pregnant mothers and older children to the ICU as well. Working 10- to-12 hour shifts and often taking night calls, Whidden and Irwin say what keeps them going is “the joy that comes with working with kids,” who become happy and playful when they begin to feel a little better than they did before.